Last month marked Veteran’s Day, which is a time to thank those who have dedicated their services – and sometimes so much more – to the safety and betterment of this country. 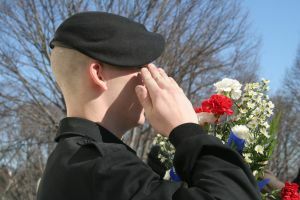 Our Boston mesothelioma lawyers know many of our military members – active and retired – have sacrificed much in order to protect us. Often, this includes their lives and their long-term health. The rank-and-file know that when they join, there is a possibility that they could be put in harm’s way. However, this does not include the anticipation of a mesothelioma diagnosis, as a result of exposure to asbestos while serving. Mesothelioma doesn’t kill as fast as combat but it’s no less deadly. The U.S. Department of Veteran Affairs estimates there are more than 22 million veterans in this country. It is among this population that we tend to see many mesothelioma diagnoses, particularly among those who served in the 1970s and earlier. These brave men and women likely went years without realizing they had been placed at risk. That’s because mesothelioma, which is a rare and fatal form of cancer that affects the lining of major organs, lies silent in the body for decades. At this point, there is no way to detect or treat it until it is in the advanced, aggressive stages. By the time a person is diagnosed and begins receiving treatment, the disease is likely to be quickly fatal. We most often hear about this cancer affecting members of the U.S. Navy due to the wealth of asbestos material used in ship products. The problem was usually worsened by the fact that as the ships began to age, the asbestos materials became more brittle and friable – and therefore much more dangerous. It’s true that of the total number of military mesothelioma sufferers, one-third are from the Navy. But the fact is, there is no branch of the military that has been untouched by this crisis. Weapons and ammunition storage rooms. Veterans who served decades ago are just now beginning to experience symptoms related to this exposure. The primary symptoms generally include chest pain, shortness of breath, wheezing or coughing, fluid build-up in the lungs, and swelling of the abdomen. It’s important for veterans experience any combination of these symptoms to see a physician right away and be tested for mesothelioma. We do know that the illness has garnered more attention from the government in recent years, as the Department of Defense awarded funding to five different mesothelioma researchers in both 2008 and 2009. Still, receiving compensation for veterans and their families for a mesothelioma diagnosis is by no means a given, which is why these individuals need to seek the advice of an experienced mesothelioma attorney as soon as possible after diagnosis. If you or a loved one is diagnosed with mesothelioma in New England, call for a free and confidential appointment at 1-888-367-2900.